buffalosabresnow: Zemgus Girgensons re-signs as Pittsburgh's reportedly looking for No. 3 center. Zemgus Girgensons re-signs as Pittsburgh's reportedly looking for No. 3 center. There might not be a correlation between the news that Buffalo forward Zemgus Girgensons re-upped with the Sabres on a 2yr./$3.2 million contract and the Pittsburgh Penguins reportedly looking to trade for a No. 3 center, but the timing is certainly interesting. Girgensons went into this off season as a restricted free agent with arbitration rights but opted to forgo the process. One by one Sabres GM Jason Botterill slowly signed his free agents, which included avoiding arbitration with three players, leaving Girgensons as the only player left to be signed. 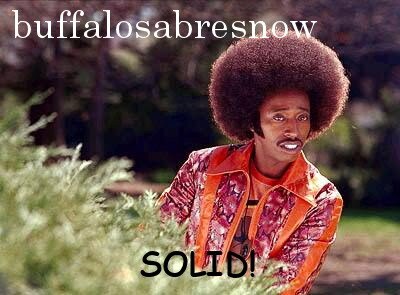 Yesterday Buffalo announced that the two sides came to an agreement. It's been rough and rocky travelling for Girgensons over the course of the last two seasons. The former first round pick (2012, 14th-overall) went from being a top-line center under Ted Nolan during the Sabres bottom-dwelling 2014-15 season to an afterthought under Dan Bylsma the last two seasons and in the process went from 30 points (15g + 15a) in 61 games to 34 points (14+20) in 146 games. Coaching seemed to play a big part in those numbers taking a huge dive as Nolan was a "work hard and good things will happen" kind of coach while Bylsma was more of an X's and O's coach. Girgensons plays a north/south power game that has him driving the net and working the puck in the corners which was perfect for Nolan's "just work hard" philosophy. Things changed, however, when Bylsma came aboard. Many who follow the Sabres closely were left with the impression that Girgensons couldn't execute in Bylsma's structured system and therefore was relegated to a lesser, bottom-six role. As he floundered in the new system his ice-time decreased and so did his overall production. Bylsma is gone now and was replaced by Phil Housley. A two-year deal for Girgensons may or may not be significant although it's a year longer than what he signed for when Bylsma was the coach meaning perhaps this regime wants to give him more of a look than a one-year, "show me" contract. Or it could be an inviting contract for a team like the Pittsburgh Penguins who are said to be looking for a No. 3 center. The two-time defending Stanley Cup Champion Penguins lost a key player in third line center Nick Bonino, as well as veteran center Matt Cullen, and they're looking to trade for a replacement for one of them. According to the Pittsburgh Post Gazette, GM Jim Rutherford wants to trade for a No. 3 center but will remain patient. "There's a couple of guys I could acquire right now," he said. "I feel like there's another group of guys that could possibly be available here soon. Kind of just waiting to see if that happens. Something could happen in the very near future or this could drag on for a little while." Buffalo's Botterill came from the Penguins organization and was Rutherford's right hand man. The two worked together to build the back-to-back Cup champions and one could assume that they keep in touch. Botterill should have a pretty good idea as to what Rutherford is looking for, and what he could get in return, as he was instrumental in building the Penguins. 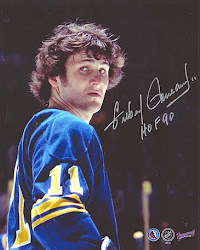 And it's possible that "the two guys" Rutherford "could acquire now" are in the Sabres organization. Girgensons could be that guy although his projected ceiling may have dropped down to a top-nine slot at best. At 23 yr.s old he's still young, just entering his prime, but he's also been subjected to mass turnover in Buffalo to the tune of three GM's and four head coaches. He has the versatility to play wing or center and although his offensive instincts seem to be limited, if he finds himself with open ice around the net, he can finish. He skates very well, is defensively responsible and can man the penalty kill. Another possibility is Johan Larsson. Larsson is a different player than Girgensons. He's slower on his skates but always seems to be around the puck and if he's not around the puck, he's around the action playing punk against the opposition. The 25 yr. old Larsson also played third-line center for the Sabres during Bylsma's two-year tenure and was making strong progress until he was lost for the season on Dec. 31 of last year. According to CapFriendly, the Penguins have $3.2 million in cap-space right now meaning either Girgensons' $1.6 million or Larsson's $1.475 million hits would fit right in. Botterill now has all of his players signed and has used 44 of his 50 pro contracts. The Sabres are $6.92 million under the NHL's $73 million cap ceiling, according to CapFriendly, which gives him plenty of maneuverability. Whether that maneuverability includes a deal with his former team remains to be seen, but it was rather interesting that the Girgensons announcement and the article on the Penguins desires came out within a day of each other.